You are currently browsing the category archive for the ‘Poets/ Writers’ category. I have a poem, “Who is the man,” in the Spring 2013 issue of Wild Goose Poetry Review. After a false start and big-time help from Rob MacEwan, the April (Poetry Month) issue of The Dead Mule is online. Each April, the Mule presents the poet laureate of a southern state. 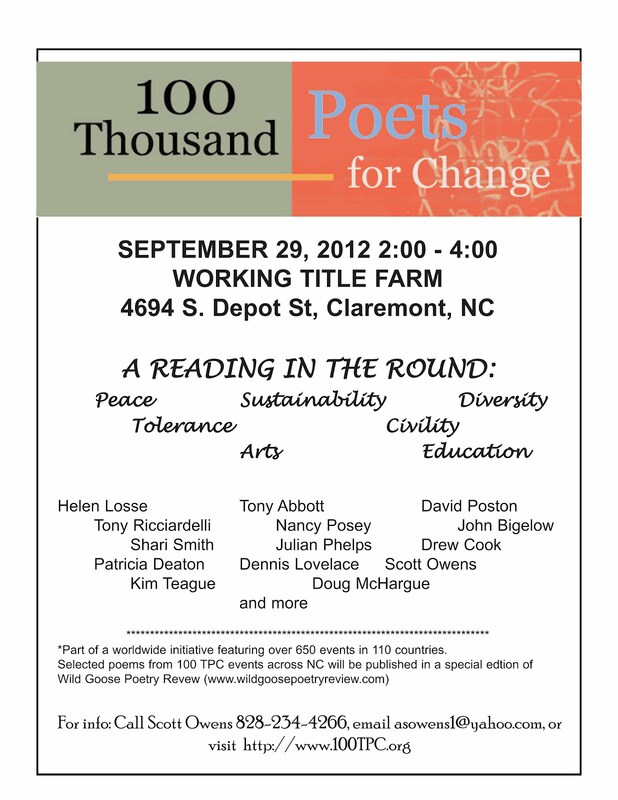 This year we are featuring NC Poet Laureate Joseph Bathanti. Also in this issue – in a feast for the poetic – are 27 other poets. I have a poem, “A mere sensation,” in the new issue of Right Hand Pointing. Many thanks to editor Dale Wisely. This poem was serendipitious ; it came about in a most unusual way – a way that has never happened to me before and most likely won’t ever again. I wrote “A mere sensation,” revised it, submitted it to Right Hand Pointing, and had it accepted for publication all the same day. This is very unusual. Writing is rewriting – revision. And if a person doesn’t like to revise, he/she really doesn’t like to write. Yes, I revised this poem, but few revisions were needed, and the revisions came more quickly than usual. It is smart to look for a litmag that needs a certain kind of poem – a market where one’s poem fits. That day Dale put out a call for poems like the one I had written. And it is usual to wait for a reply. Dale is quicker than most editors with both acceptances and rejections. (Yes, he’s rejected poems of mine in the past. He’s also accepted a few.) So I went through the usual steps but the process was accelerated. I have a poem, “Product of War,'” in the latest issue of Wild Goose Poetry Review. Thanks to editor Scott Owens. I have a new poem “In the fall” in vox poetica today. Many thanks to editor Annmarie Lockhart. I was on the Joseph Milford Poetry Show last Friday, November 9. Here’s the recording. I read from Seriously Dangerous (also available on amazon.com), Mansion of Memory (a few copies available from me), Better With Friends, and my new (in progress) manuscript, Red Berries From the Mountain Ash. Many thanks to Joe Milford. Many thanks to thank the editors and publishers at Women’s Voices for Change for selecting my poem “Evergreen Today” (from Seriously Dangerous) to be featured in their Poetry Sunday column. Poetry Editor Helen Losse has submitted the following poets and their poems published in the Dead Mule to the 2012 Best of the Net. Congratulations to all. I had a poetry reading in Joplin.